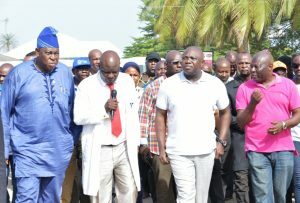 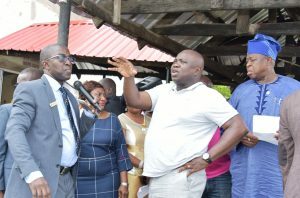 Lagos State Governor, Mr. Akinwunmi Ambode (middle); Medical Director/CEO, General Hospital, Badagry, Dr. Opeyemi Aihonsu (right) and Special Adviser to the Governor on Primary Health Care, Dr. Olufemi Onanuga (left) during an inspection tour of the General Hospital, Badagry, recently. 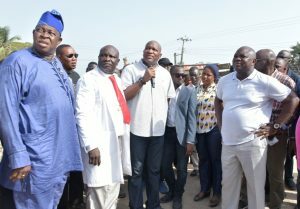 Lagos State Governor, Mr. Akinwunmi Ambode (2nd right); Commissioner for Waterfront Infrastructure Development, Engr. 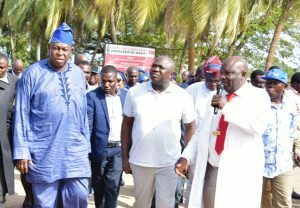 Adebowale Akinsanya (right); Special Adviser to the Governor on Primary Health Care, Dr. Olufemi Onanuga (left) and Medical Director/CEO, General Hospital, Badagry, Dr. Opeyemi Aihonsu (2nd left) during an inspection tour of the General Hospital, Badagry, recently. 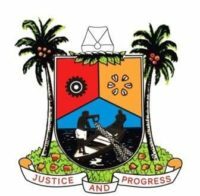 NIGHT VIEW OF WATER FOUNTAIN BUILT AT ABULE EGBA JUBILEE BRIDGE BY LAGOS STATE GOVERNMENT.